Plans for the outdoor spaces continue to evolve as I gather information and consult trusted experts. One of those experts is Berkeley artist and landscape designer Keeyla Meadows. I first met Keeyla twenty-some years ago when I was scouting gardens for a garden tour fundraiser for our kids’ grade school. Someone tipped me off to Keeyla’s garden and I drove right over and peeped over her fence. (Shameless, I know.) The incredible explosion of red and pink poppies waving in the sunlight looked like Mother Nature’s ultimate Valentine. Over the years that effervescent field of poppies has turned into an art-filled outdoor gallery replete with sculpture, water features and artful plantings. Keeyla’s won numerous awards, written two beautiful books on color and design and been published widely. It’s always a treat to write about her gardens. As I’ve pondered what to do with the unusual mix here—a stark modern home on the edge of wild, open space—I wondered if Keeyla might have some answers for me. We met up this week and I’ve been dreaming about possibilities ever since. Her initial vision for the garden? 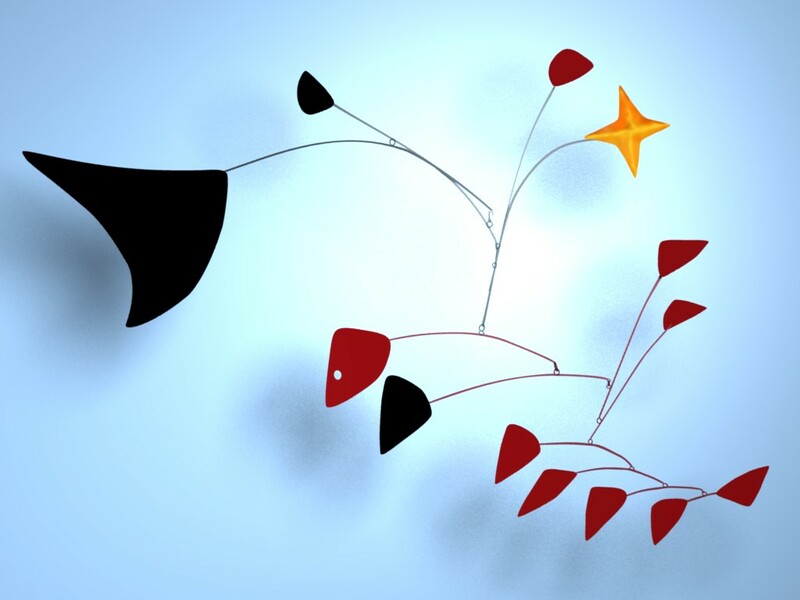 Take inspiration from a Calder mobile, creating blocks of color and incorporating movement to make the most of the architecture and the setting. I love the idea. Can’t wait to show you how this plays out. Swirly water from a fabulous faucet. Ruth Reichl uses ketchup and Worcestershire sauce to clean her copper pots. Really. Creativity exercises for those feeling blocked—or just housebound and bored. This new-to-me Annie Dillard essay about an eagle and a weasel, brought to my attention by the fabulous folks on the Slate Culture Gabfest podcast. And finally, a little peek into Jack Black’s California roots. This entry was posted in Shelter, Style and tagged architecture, art, gardens, interior design, Keeyla Meadows. Bookmark the permalink. Post a comment or leave a trackback: Trackback URL.